For other uses, see Pripyat (disambiguation). Pripyat or Prypiat (Ukrainian: При́п'ять, translit. Pryp"iat' [ˈprɪpjɑtʲ], Russian: При́пять) is a ghost town in northern Ukraine, near the Ukraine-Belarus border. Named after the nearby Pripyat River, Pripyat was founded on 4 February, 1970, as the ninth nuclear city (a type of closed city) in the Soviet Union, to serve the nearby Chernobyl Nuclear Power Plant. It was officially proclaimed a city in 1979, and had grown to a population of 49,360 by the time it was evacuated on the afternoon of 27 April 1986, the day after the Chernobyl disaster. Though Pripyat is located within the administrative district of Ivankiv Raion, the abandoned city now has the status of city of oblast significance within the larger Kiev Oblast (province), being administered directly from Kiev. Pripyat is also supervised by Ukraine's Ministry of Emergencies, which manages activities for the entire Chernobyl Exclusion Zone. Access to Pripyat, unlike cities of military importance, was not restricted before the disaster as nuclear power stations were seen by the Soviet Union as safer than other types of power plants. Nuclear power stations were presented as being an achievement of Soviet engineering, where nuclear power was harnessed for peaceful projects. The slogan "peaceful atom" (Russian: мирный атом, translit. mirnyy atom) was popular during those times. The original plan had been to build the plant only 25 km (16 mi) from Kiev, but the Ukrainian Academy of Sciences, among other bodies, expressed concern about it being too close to the city. As a result, the power station and Pripyat were built at their current locations, about 100 km (62 mi) from Kiev. 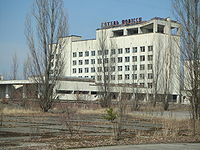 After the disaster the city of Pripyat was evacuated in two days. A panorama of Pripyat during summer. The Chernobyl power plant, currently undergoing decomissioning, is visible in the distance, at top center. The Azure Swimming Pool was still in use by liquidators in 1996, a decade after the Chernobyl incident. In 2009, over two decades after the Chernobyl incident, the Azure Swimming Pool shows decay after years of disuse. In 1986 the city of Slavutych was constructed to replace Pripyat. After the city of Chernobyl, this was the second-largest city for accommodating power plant workers and scientists in the Commonwealth of Independent States (CIS). 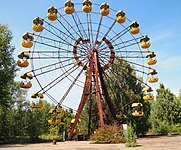 One notable landmark often featured in photographs of the city and visible from aerial-imaging websites is the long-abandoned Ferris wheel located in the Pripyat amusement park, which had been scheduled to have its official opening five days after the disaster, in time for May Day celebrations. The Azure Swimming Pool and Avanhard Stadium are two other popular tourist sites. The following statistics are from January 1, 1986. Population: 49,400 before the disaster. The average age was about 26 years old. Total living space was 658,700 m2 (7,090,000 sq ft): 13,414 apartments in 160 apartment blocks, 18 halls of residence accommodating up to 7,621 single males or females, and eight halls of residence for married or de facto couples. Education: 15 kindergartens and elementary schools for 4980 children, and 5 secondary schools for 6786 students. Healthcare: One hospital that could accommodate up to 410 patients, and three clinics. Trade: 25 stores and malls; 27 cafes, cafeterias and restaurants could serve up to 5,535 customers simultaneously. 10 warehouses could hold 4,430 tons of goods. Culture: Three facilities: a culture palace, the Palace of Culture Energetik, a cinema and a school of arts, with eight different societies. Sports: 10 gyms, three indoor swimming-pools, 10 shooting galleries, two stadiums. Recreation: One park, 35 playgrounds, 18,136 trees, 249,247 shrubs, 33,000 rose plants. Industry: Four factories with total annual turnover of 477,000,000 rubles. one nuclear power plant with four reactors. Transportation: Yanov railway station, 167 urban buses, plus the nuclear power plant car park which had 400 spaces. Telecommunication: 2,926 local phones managed by the Pripyat Phone Company, plus 1,950 phones owned by Chernobyl power station's administration, Jupiter plant and Department of Architecture and Urban Development. The external relative gamma dose for a person in the open near the Chernobyl disaster site. The intermediate lived fission products like Cs-137 contribute nearly all of the gamma dose now after a number of decades have passed, see opposite. The impact of the different isotopes on the radioactive contamination of the air soon after the accident. Drawn using data from the OECD report  and the second edition of 'The radiochemical manual'. A natural concern is whether it is safe to visit Pripyat and the surroundings. The Zone of Alienation is considered relatively safe to visit, and several Ukrainian companies offer guided tours around the area. At present, radiation levels have dropped considerably, compared to the fatal levels of April 1986, due to the decay of the short-lived isotopes released during the accident. In most places within the city, the level of radiation does not exceed an equivalent dose of 1 μSv (one microsievert) per hour. Markiyan Kamysh novel about Chernobyl illegal trips, A Stroll to the Zone, was praised by reviewers as the most interesting literature debut in Ukraine. The novel has been translated into French (in title La Zone), and was published by French publishing house Arthaud (Groupe Flammarion), and was warmly welcomed by critics and praised in French magazines. In 2006, musician Example featured Pripyat in his 18-minute documentary of the ghost town, and for his promotional video for his track, "What We Made". A portion of the 2007 first-person shooter video game Call of Duty 4: Modern Warfare takes place in Pripyat. It also appears in the game's infamous "Fifty-thousand people used to live here. Now it's a ghost town" title sequence. The segment was also referenced in the game's 2011 sequel, Call of Duty: Modern Warfare 3. The city of Pripyat was the location of filming of the 2008 documentary White Horse. The exclusion zone is the setting for Karl Schroeder's science fiction short story "The Dragon of Pripyat". The novel Wolves Eat Dogs by Martin Cruz Smith uses Pripyat as the setting for an investigation by Arkady Renko. Much of the James Rollins novel The Last Oracle takes place in Pripyat and around Chernobyl. The story revolves around a team of American "Killer Scientist" special agents who must stop a terrorist plot to unleash the radiation of Lake Karachay on the world during the installation of the new sarcophagus over the Chernobyl nuclear power plant. The American paranormal investigation series Destination Truth conducted an overnight investigation within Pripyat. Ukrainian singer Alyosha recorded most of the video for her Eurovision 2010 entry "Sweet People" in Pripyat. The song "Dead City" (Ukrainian: Мертве Місто) by Ukrainian Symphonic Metal band DELIA is about Pripyat, and scenes from the music video were shot in the city. DELIA's vocalist, Anastasia Sverkunova, was born in Pripyat just before the Chernobyl disaster. The majority of the 2011 movie Land of Oblivion was shot on location in Pripyat. In the 2011 Batwoman comic book series, the final mission of Kate Kane's training to become the titular superhero consists of a hostage rescue in the city. The 2012 horror movie Chernobyl Diaries was inspired by the Chernobyl disaster in 1986 and takes place in Pripyat. The plot of the 2013 film A Good Day to Die Hard is partly set in Pripyat. Marillion guitarist Steve Rothery's first solo album is called The Ghosts of Pripyat (2014). The third episode of the 21st series of Top Gear features two of the presenters driving through the abandoned city. German pianist and composer Hauschka features Pripyat on the second track of his album Abandoned Cities. Pripyat is featured in the History Channel documentary called Life After People. Filmmaker Danny Cooke used a drone to capture shots of the abandoned amusement park, some residential shots of decaying walls, children's toys and gas masks. He collected them in a 3-minute short film Postcards From Chernobyl, released in November 2014, while making footage for the CBS News 60 Minutes episode in early 2014 "Chernobyl: The Catastrophe That Never Ended". In 2014, for the twentieth anniversary of the original release of The Division Bell, a music video for the song "Marooned" was produced and released on the official Pink Floyd website. Aubrey Powell of Hipgnosis directed the video, filming some parts in Pripyat, during the first week of April 2014. In May 2015 the drone manufacture DJI produced Lost City of Chernobyl, a documentary film about the work of photographer and cinematographer Philip Grossman and his five-year project in Pripyat and the Zone of Exclusion. With the help of drones the 2016 film The Girl with All the Gifts shot its aerial views of a deserted London in Pripyat. Ed Edd n Eddy shows a cameo of Pripyat in a jawbreaker storage vault in the episode "Once upon an Ed". Manhunt: Unabomber S1:E3 mentions this town as the homeland of Slavic People. Scottish post-rock band Mogwai included a song called Pripyat on their 2016 album Atomic, which is a soundtrack to the Mark Cousins documentary Atomic, Living in Dread and Promise. 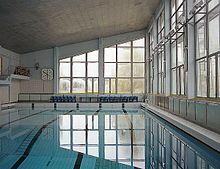 The Azure swimming pool in Pripyat is featured in the 2017 video game PlayerUnknown's Battlegrounds. English rock band Suede used the city to shoot their music video clip Life Is Golden, including takes of the Azure Swimming Pool, Pripyat amusement park, and Polissya hotel. Australian Rapper Seth Sentry wrote a two-part song "Pripyat" in his 2015 album Strange New Past. The 2011 film Transformers: Dark of the Moon shows a brief mission to Pripyat where the Autobots are first attacked by Shockwave while searching for a piece of alien technology which, in universe, is explained as being the catalyst to the Chernobyl disaster. In the videogame Counter-Strike: Global Offensive the map named Cache sees the action in the Pripyat area, with the Terrorist team trying to blow up a warehouse which could presumably contain nuclear waste, while the Counter-Terrorist team tries to stop it. One special forces mission of the multi-player shooter Warface features a mission in the Pripyat area including locations like the Azure Swimming Pool and Pripyat Amusement Park. The city was served by Yaniv station on the Chernihiv–Ovruch railway. It was an important passenger hub of the line and was located between the southern suburb of Pripyat and the village of Yaniv. An electric train terminus Semikhody, built in 1988 and located in front of the nuclear plant, is currently the only operating station near Pripyat connecting it to Slavutych. ^ "City Phone Codes". Archived from the original on 2015-08-15. Retrieved 2 December 2014. ^ "Chernobyl and Eastern Europe: My Journey to Chernobyl 6". Chernobylee.com. Archived from the original on 2013-10-15. Retrieved 2013-10-15. ^ "Pripyat – City of Ghosts". Archived from the original on 2016-02-17. Retrieved 2016-02-13. ^ "History of the Pripyat city creation". Archived from the original on 2011-07-22. Retrieved 2 December 2014. ^ Anastasia. "dirjournal.com". Info Blog. Archived from the original on 2014-11-17. Retrieved 2 December 2014. ^ Hjelmgaard, Kim (2016-04-17). "Pillaged and peeling, radiation-ravaged Pripyat welcomes 'extreme' tourists". USA Today. Retrieved 2019-03-27. ^ Gais, Hannah; Steinberg, Eugene (2016-04-26). "Chernobyl in Spring". Pacific Standard. Retrieved 2019-03-27. ^ "Chernobyl Tour". Archived from the original on 2016-01-31. Retrieved 2016-02-13. ^ "Chernobyl Welcome". Archived from the original on 2016-02-11. Retrieved 2016-02-13. ^ "Chernobyl Tours by Solo East Travel". Archived from the original on 2019-01-25. Retrieved 2019-01-26. ^ "Tour Chernobyl". Archived from the original on 2018-11-27. Retrieved 2019-01-26. ^ "Lupine Travel - Chernobyl". Archived from the original on 2016-01-25. Retrieved 2016-02-13. ^ "Tour2Chernobyl". Archived from the original on 2018-04-27. Retrieved 2018-12-10. ^ "Tour2Kiev". Archived from the original on 2015-12-24. Retrieved 2016-02-13. ^ "Pripyat - Chernobyl Tour". Archived from the original on 2016-03-02. Retrieved 2016-02-13. ^ "Bugging In and Bugging Out". Archived from the original on 2016-04-09. Retrieved 2016-02-13. ^ "Radiation levels". The Chernobyl Gallery. Archived from the original on 2014-09-29. Retrieved 2014-12-02. ^ "Tchernobyl 30 ans après : au coeur de la zone interdite". L'Obs (in French). Archived from the original on 2017-09-15. Retrieved 2017-10-02. ^ "Littérature : "La Zone" de Markiyan Kamysh et "La Maison dans laquelle" de Mariam Petrosyan". France Culture (in French). Archived from the original on 2017-10-02. Retrieved 2017-10-02. ^ "Reportage dans la zone interdite de Tchernobyl". Les Inrocks (in French). Archived from the original on 2017-10-02. Retrieved 2017-10-02. ^ "DELIA". Archived from the original on 2014-12-11. Retrieved 2 December 2014. ^ "Witness a Drone's Eye View of Chernobyl's Urban Decay". The Creators Project. Archived from the original on 2014-11-26. Retrieved 2 December 2014. ^ "من فوق.. كيف يبدو ما بقي من تشيرنوبل بعد 30 عاما من الكارثة النووية؟". CNN Arabic. Archived from the original on 2015-07-24. Retrieved 2 December 2014. ^ Johns, Matt (19 May 2014). "Pink Floyd release new Marooned video...and TDB20 countdown!". brain-damage.co.uk. Archived from the original on 2014-05-22. Retrieved 17 June 2014. ^ "Pink Floyd to Release 20th Anniversary Box Set of "The Division Bell"" (Press release). 20 May 2014. Archived from the original on 2014-03-04. Retrieved 6 June 2014. ^ Wiseman, Andreas (4 August 2016). "The story behind 'The Girl With All The Gifts'". Screen International. Archived from the original on 2016-09-20. Retrieved 13 September 2016. ^ ""Atypical Games launches Radiation City"". Archived from the original on 2017-09-03. Retrieved 2017-09-02. ^ "Radioactive Railroad". Archived from the original on 2015-11-21. Retrieved 2015-11-25. Wikimedia Commons has media related to Pripyat.